When I start planning a trip to a new country or city, one of the first things I look up is the classic New York Times travel pieces called “36 Hours in [Insert city here].” It’s often informative, helpful, and gives a pretty good weekend itinerary for the featured city. Though the New York Times is an undoubtably fantastic institution, they have failed travelers to Rwanda for years! Yes, truly! While nearby cities like Nairobi and Stone Town get the classic “36 Hours” travel guides, Kigali has been sadly forgotten. Let me set the scene for you. Your colleagues are in town. They want to see your life. They want to party. They live in (insert Nairobi, New York, Addis, London, or Kampala here), and have a superiority complex. They’ve heard Kigali isn’t that fun, is too quiet, our food is bad, and the city is freakishly clean. Though they are absolutely right that it’s freakishly clean (which we love), they’re wrong about everything else. And it’s time for you to prove it. This scenario has happened to just about everyone I know, and applies to familial visits, college roommates, and goodness knows who else. Though we published a suggested itineraries for Rwanda guide, it only spends just a few paragraphs focusing on Kigali! And with the New York Times 36 hour guide failing you, I’m sure you’re all reading this and only growing more distraught by the second. But, never fear! Here at Living in Kigali, we can remedy that! What’s more, we will give you an additional 40 hours FOR FREE. Because we just love you so dang much. Consider this a guide not just for your visitors, but for you and your friends as well as inspiration to keep yourself social and active in this wonderful wonderful city. Grab a brand new, updated version of The Map – Kigali for directions and let us present: 76 Hours in Kigali! 2pm: Welcome to Kigali! After a quick stop at your hotel, you’re going to hit the ground running. Best way to do that? Immerse yourself in the sights, sounds, and smells at Kimironko Market. This bustling market is one of the largest in the city, and houses a diverse vegetable selection, fabric from all over the continent, hand-woven baskets, and more. Head back to your hotel after all your hard bargaining to drop of your new purchases and catch a quick rest before the rest of the evening’s activities. 5pm: Gelato at Delizia Italiana. Located in Kigali Heights, the newest mall to hit Kigali with a perfect view of the convention center, this new spot is delicious. Delizia Italiana is a great place to see and taste a bit of new Kigali, and ice cream pre happy hour? Why not! For the low price of Rwf 3,000, you can snag two flavours in a cup or a cone. Try the ricotta and pear to mix it up, or stick with the traditional (and delicious) chocolate or nutella. 6pm: After Kimironko and ice cream, it’s time for a drink. On Thursdays, the Inema Happy Hour is the place to be. From 6 to 7pm, it’s buy one cocktail get one free, and there is often fantastic live music playing in the background. Additionally, this is an art gallery! Grab your cocktail and wander the halls, checking out Rwandan art in a creative and vibrant setting. 8pm: Dinner at Repub Lounge should be a mandatory part of anyone’s Kigali visit. The views from the porch at Repub Lounge are not easily forgotten, and the offerings of upmarket Rwandan cuisine are tasty and reliable. Thursday nights are also jazz nights at Repub, so tuck into a brochette (or other grilled fish or meat), snag a carafe of house wine, and enjoy your first night in Kigali! 11pm: Not tired yet? Ready to keep going? 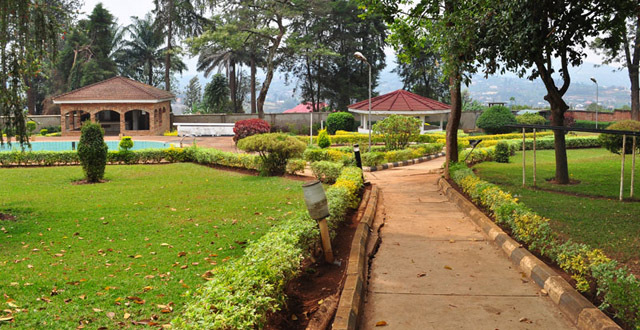 Head to Le Must, a Kigali institution. Le Must is a bar located in Kiyovu, and gets going pretty late on Thursday nights. 9am: The newest bakery to hit the Kigali scene is Baso Patissier. 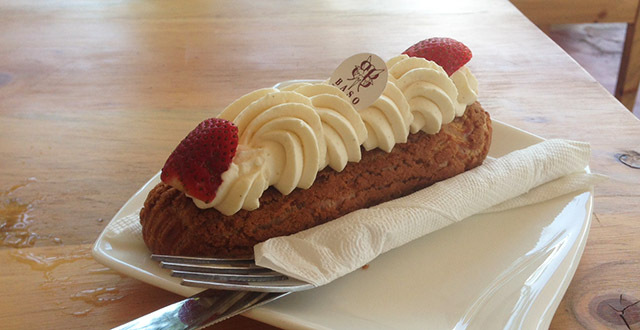 Order one of their famous vanilla eclairs and charge up for the packed day ahead! 10am: Kigali’s fashion and handicrafts scene has evolved exponentially over the past five years. Though baskets and kitenge fabric are still fan favorites, there is so much more on offer. Head first to Go Kigali boutique at the Marriott, and check out jewelry, leather, clothes, and more from Rwanda, Ethiopia, and Kenya. Afterwards, scoot right next door to Sonia Mugabo, one of Rwanda’s premier fashion designers. Next, stop in Kimihurura at Abraham Konga Collections for beautiful handmade jewelry and an assortment of other gift items. Finally, hit up the Nyarutarama neighborhood for Haute Baso, another great fashion boutique. 12:30pm: After all that shopping, time for lunch! Eat a grilled cheese at Inzora in Kacyiru, while enjoying one of my favorite views in the city. Polish off lunch with a tasty baked good (the gluten free brownie is absurdly good), and a coffee or a natural soda (the strawberry natural soda is wonderful). 1:30pm: Time to engage with some history. After lunch, head to the Kigali Genocide Memorial to learn about the 1994 genocide, and pay respects to the country’s not-so-distant past. The memorial and museum, while harrowing, also tell an important and vivid story. Make sure to give yourself enough time there, as the memorial closes at 4pm. 5:30pm: After the memorial and a visit back to your hotel for a little rest, head to the roof of Ubumwe Grande Hotel for a cold beer, a spectacular city view of the sunset, and a bit of reflection. 8pm: Hungry yet? Hop a moto and drive to Panorama 10 to 2 or Green Corner in the lively Nyamirambo neighborhood for big fish. The giant tilapia (dubbed ‘Big Fish’) stuffed with spices and onions, and served with chips, potatoes, and plantains, is enough to feed three people, and makes for an awesome social outing. Call in advance to make sure you don’t wait for three hours, and get ready to literally dig your hands in – this is a necessary Kigali experience! 10pm: It’s Friday night, and after your packed, wonderful, emotional, silly, and delicious day, it’s time to get your party on. 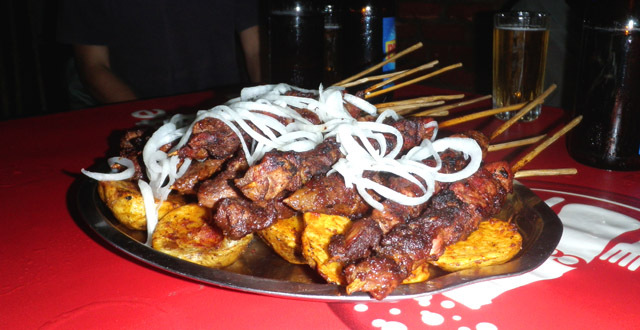 Head to Choma’d for drinks and to check out the Kigali social scene (Choma’d also has some excellent grilled food if you’d rather do dinner here than trekking out to Nyamirambo). After Choma’d, go to Papyrus for more drinks and then Cocobean for even more drinks and dancing. This is going to be a late night, so pace yourself (or not) and get excited. 10am: Time for a spa morning. We decided to give you a bit of a lie in since we love you and know you probably partied pretty hard last night, and nothing says hangover cure like a spa day. Sunset Spa in Kibagabaga offers some pretty great deals, including just Rwf 10,000 for a manicure and pedicure (total! ), Rwf 15,000 for a Swedish massage, and Rwf 15,000 for a basic facial. If you’d rather not make the trek all the way out to Kibagababa, we’d also recommend Soothing Corner Spa in Kacyiru for great prices and friendly service. If the spa isn’t your style, check out the schedule at Yego Yoga – an awesome pop-up yoga studio – and get some early morning movement happening! 1pm: After the spa or yoga, food and even more relaxation is in order. Check out Pili Pili or Caiman. Located in Kibagabaga, and just a fifteen minute walk over from Sunset Spa and in view of Kigali’s classic hilly skylines, both Caiman and Pili Pili are two of my favorite places to hang out on a given Saturday afternoon. Caiman’s grilled chicken is unparalleled in the city, and the pool scene and sangria at Pili Pili is the most enjoyable. You can’t go wrong with either! 7pm: After a day of relaxing and eating, it’s time for even more food! Tired of brochettes? Don’t even worry! Kigali has plenty of international offerings that, in recent years, have become serious top quality options. Check out Zaaffran for Indian food, Kiseki for sushi (one of my new favorite spots in the city), Poivre Noir for French fusion, or Casa Keza for tapas. 9pm: More parties! There are often different things happening around the city on the weekends – from visiting DJs to concerts to themed events. Use the Living in Kigali events calendar to check out what’s going on around town, make some new friends, and probably drink a few too many Skol Lagers. 10am: It’s not a weekend in Kigali if you don’t spend Sunday having brunch and hanging by the pool at the Milles Collines until your afternoon flight! For just Rwf 15,000, you can eat unlimited amounts of brunch (I’ve seen friends (might possibly be referring to myself here) throw back an ungodly amount of strawberry tarts). Don’t forget your brunch receipt, as it gives you access to the pool chairs and the pool itself. 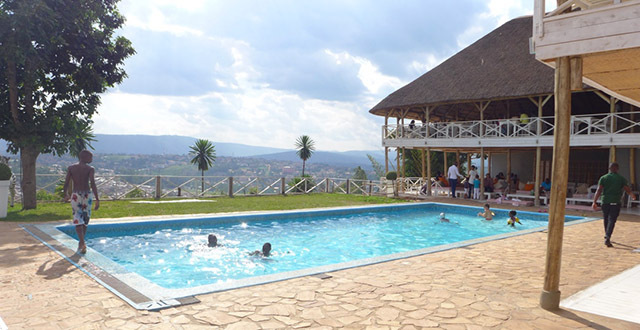 This pool is undoubtedly a place where a lot of expats and visitors to Kigali congregate on Sunday mornings and afternoons, and there is a reason: it is lovely! The food is good, the pool is great, the chairs are comfy, and the sun is often shining. 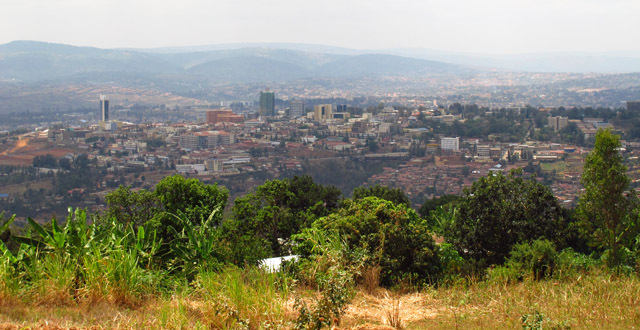 2pm: For the last section of your Kigali weekend, it’s time for a Go Kigali tour! 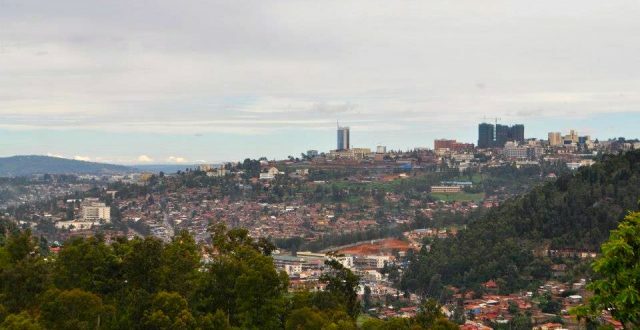 This awesome tour company (yes, affiliated with the boutique at the Marriott) will take you through the city, and give you a chance to witness Kigali’s multifaceted nature, impressive growth, tasty treats, and stunning views. For USD $55 (for a half-day tour lasting four hours) you will trek up Mt. 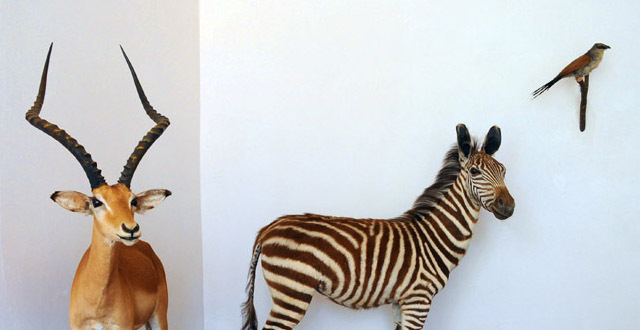 Kigali, visit a milk bar, go on a mural walk, and so much more. It’s a great way to end your Kigali trip with a bang, and leave you wanting to come back for more. 6pm: You’re done! You’re leaving us! Safe flight, we miss you already! So! That’s it! Your perfect non-New York Times affiliated 76 hours guide to Kigali. Did you like it? What do you think, friends? Give us your thoughts in the comments section, and let us know if we missed anything! Love this informative site. In fact I’ll like to be guided on what best to venture into, should my thoughts of relocating to Kigali -Rwanda become a reality. I’m a Nigerian, an interior designer, a pattesier and gemstone hobbyist.